Intraoperative consultation is necessary for the neurosurgical practice to optimize surgical procedure. Both cytology and frozen section (FS) is the important diagnostic tool for the same and avoids unnecessary extensive craniotomy, guides the neurosurgeon during surgical resection in targeting the lesion and modify the extent of surgery., This is more often important in intracranial lesion due to the obvious reasons of morbidity associated with the disease and the surgical procedure. However, the result varies for both cytology (crush/squash) and FS preparations in the rapid intraoperative diagnosis due to the inadequate experience of the pathologist for the neurosurgical specimen and their poor interpretation toward the definitive diagnosis. In a developing country like India, with the limited availability of the FS machine and difficulty in its maintenance, cytology is considered as a preferred technique over the FS preparation for intraoperative diagnosis of central nervous system (CNS) tumor. Furthermore, friable nature of brain tissue may form ice crystal artifacts on FS causing diagnostic interference. Looking into the literature, there have been different studies in the past focusing on individual results of cytology, and the FS preparation for the diagnosis of intraoperative CNS lesions and few have demonstrated the correlation between them. In the current study, we have demonstrated the correlation between the results of cytology and FS preparations with the final histopathological finding in 63 consecutive patients having CNS lesions. This was a prospective study conducted in the Department of Pathology in a tertiary care referral hospital from July 2012 to January 2015 with the collaboration of the Department of Neurosurgery. A total of 63 consecutive cases (including benign and malignant lesion of the brain and spinal cord) were included in the study. Biopsy specimens of all intracranial lesions were collected intraoperatively. Crush/squash smears and FS were prepared immediately intraoperatively for each case. Special care was given to take smears, FSs and paraffin processed preparations from the closest possible areas of the specimen. For each case, minimum 3 smears were prepared. One was fixed immediately in 95% ethanol and stained with rapid hematoxylin and eosin stain. Other smears were air-dried and stained with toluidine blue and by Leishman's stain. The FS were stained with rapid hematoxylin and eosin stain. Samples inadequate for the above three procedures were excluded from the study. Tumors were classified according to the WHO classification and were graded intraoperatively where ever possible. When needed, immunohistochemical stains were employed to the pathological specimen for final diagnosis. Both cytology and FS results were correlated with the final histopathological diagnosis and categorized it into three groups. The complete correlation was considered when cytology/FS preparation were found identical to the final histopathological diagnosis. Partial correlation was considered when there ±1 grade of deviation in tumor grading or diagnosis of the cell line of origin was registered. When the intraoperative diagnosis was not confirmed by the final histopathology, it is noted as no correlation (wrong diagnosis). Data collected were statistically analyzed and compared between the intraoperative diagnostic procedures (crush cytology and FS) to that of final histopathological diagnosis. Of 63 cases, 30 patients were male and 33 were female. Majority of patients 46 (73.02%) were in the age group between 21 and 50 years. Of 63 cases, brain and spinal cord were found to be involved in 56 (88.89%) and 7 (11.11%) cases, respectively. Among the brain lesions, cerebrum (35/56: 62.5%) was the most common site to be involved followed by sellar/suprasellar region (11/56: 19.64%), cerebellopontine angle (5/56: 8.93%) and posterior fossa including cerebellum (5/56: 8.93%). Out of the total 63 cases, 55 (87.3%) cases were found to be neoplastic lesions and 8 (12.7%) were nonneoplastic comprised benign cysts and inflammatory lesions affecting the brain and spinal cord. 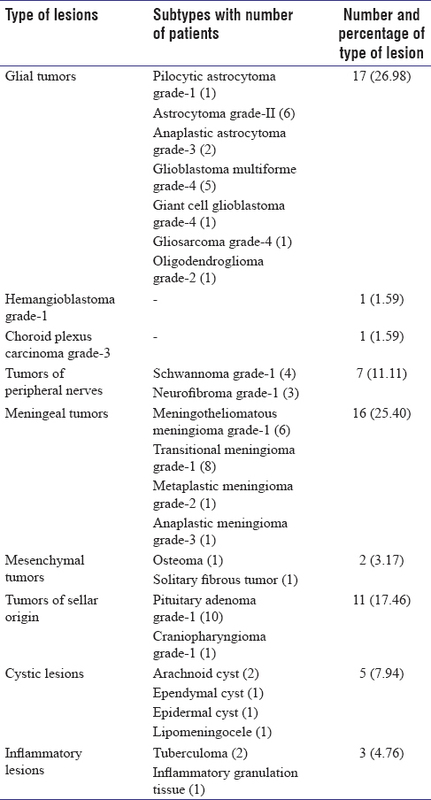 Glial tumors, meningiomas, tumors of sellar region, peripheral nerve tumors, mesenchymal tumor, hemangioblastoma, and choroid plexus carcinoma were the neoplastic lesions constituting 30.91% (17/55), 29.09% (16/55), 17.46% (11/55), 12.72% (7/55), 3.63% (2/55), 1.82% (1/55), and 1.82% (1/55), respectively and benign cysts and inflammatory lesions were nonneoplastic lesions constituting 62.5% (5/8) and 37.5% (3/8), respectively [Table 1]. Of a total of 63 cases, two cases could not be identified on crush preparation due to the inadequate material for the diagnosis. One was diagnosed with pituitary adenoma both in frozen and histopathological section. The other was diagnosed with cholesteatoma on FS and inflammatory granulation tissue on histological section. Similarly, 3 cases could not be identified on FS due to the freezing artifacts, i.e., ice crystal artefacts making morphological interpretation of frozen sectioned tissue difficult. These were diagnosed with glioblastoma multiforme (GBM) (1 case) and meningiomas (2 cases) on the final histological section. However, crush preparation in these cases was diagnostic. 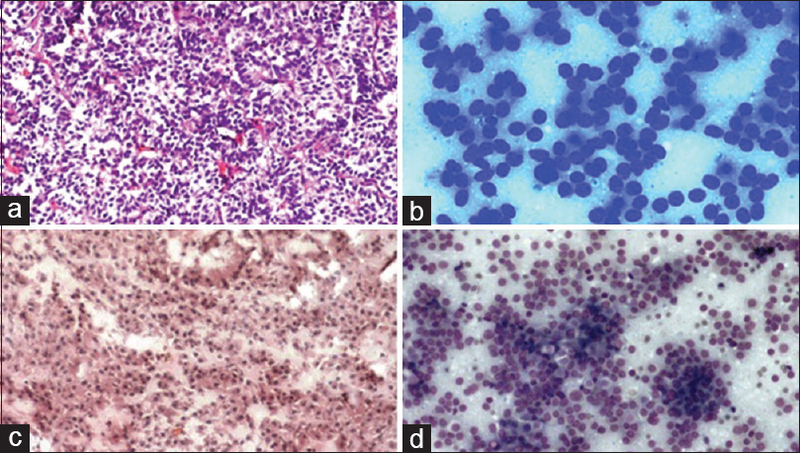 Cytological and FS diagnoses were correlated with the final histopathological diagnosis in each case [Figure 1] and [Figure 2]. The correlation of cytological preparation was found in 57 out of 61 cases (93.44%) and in FS it was 56 out of 60 cases (93.33%). Out of 61 cases where cytological preparations were adequately made, cytological diagnosis showed complete correlation with paraffin section histopathological diagnosis in 49 (80.33%) cases [Figure 3], partial correlation in 8 (13.11%) cases and in 4 (6.56%) cases, the cytological diagnosis did not correlate with the final diagnosis [Table 2]. 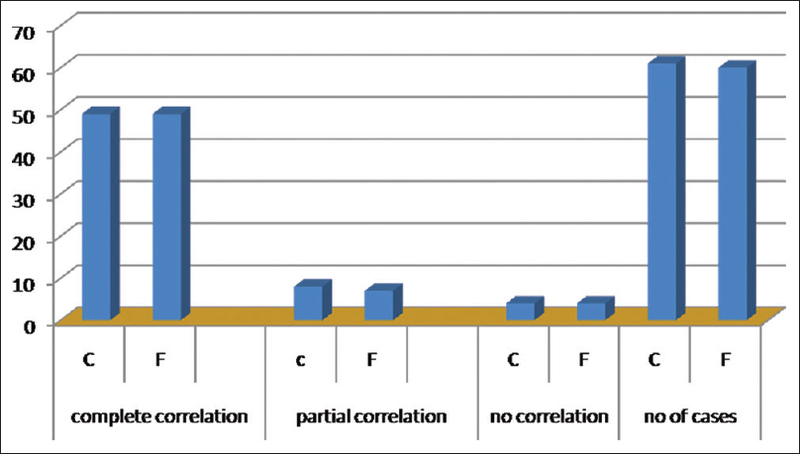 Out of 60 cases where material was adequate and proper sections could be made to reach a diagnosis, the FS diagnosis completely correlated with final diagnosis in 49 (81.67%) cases, partial correlation in 7 (11.67%) cases and no correlation in 4 cases (6.66%) [Figure 4]. However, there was no significant difference in diagnostic accuracy was found between cytology and FS preparation (P = 0.961) when there was complete correlation and P = 0.941 when both complete and partial correlations were considered [Table 2]. Accurate diagnosis of the cytological preparation is possible when there is adequate cellular material available for interpretation as shown in [Table 2]. The complete correlation/diagnostic accuracy of cytology for glial tumors, meningeal tumors, and sellar tumors were 88.24%, 75%, and 100%, respectively. Whereas, the complete correlation/diagnostic accuracy of FS for glial tumors, meningeal tumors, and sellar tumors were 87.5%, 85.71%, and 100%, respectively. Inconclusive diagnosis of the cytology was found in 4 cases (6.56%). A case of choroid plexus carcinoma which was diagnosed with choroid plexus papilloma on cytology. This was due to low-grade cytological atypia and the invasion of tumor cells into brain substance could not be documented in cytological preparations for obvious reasons. However, the lesion was correctly diagnosed on FS as the invasive character of lesions in brain substance was evident. One case was solitary fibrous tumor which was diagnosed as benign neurogenic tumor as only benign spindle cells were seen embedded in myxoid stroma, and the lesion solitary fibrous tumor being a rare entity was not suspected initially. 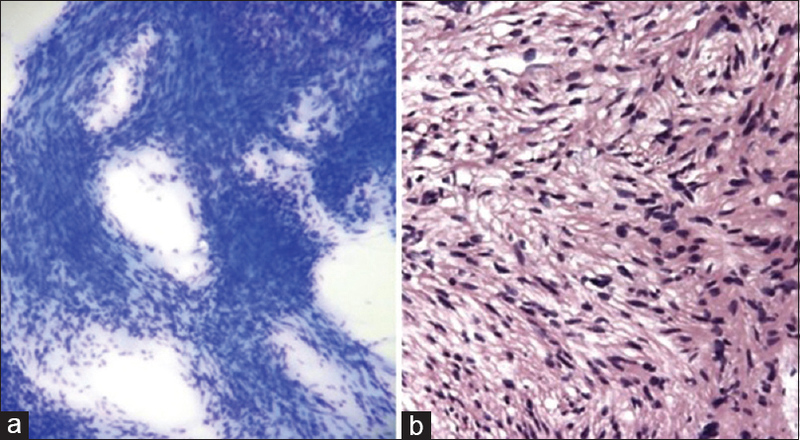 A case of neurilemmoma was diagnosed with clear cell neoplasm due to the clear cell change in the cellular content of neurilemmoma. A case of tuberculoma was diagnosed with xanthomatous inflammation as the epithelioid cells seen were large and plump with a large component of foamy macrophages. Similarly, inconclusive diagnosis of the FS preparation was found in 4 (6.67%) cases. A case of cholesteatoma on FS was reported as inflammatory granulation tissue on paraffin section. The discrepancy was due to the epithelial component being used up in intraoperative diagnostic procedures. The cases of solitary fibrous tumor and neurilemmoma (schwannoma) being reported as benign neurogenic tumor and spindle cell lesion with clear cell component were the same cases described in discrepant crush preparation. A case of tuberculoma was reported as pleomorphic xanthoastrocytoma on FS, probably due to exaggerated cellular details on FS. Out of these 8 cases showing partial correlation of cytology with final diagnosis, four cases were meningiomas where typing on cytological preparation did not correlate with the typing in final diagnosis, that was due to one component of tumor not being represented in cytological preparation and cellular features being exaggerated. However, there was no discrepancy as regards biological behavior. Two cases reported as benign neurogenic tumor on cytology were reported as neurofibroma on permanent paraffin sections. One case of grade III astrocytoma reported on cytological preparation turned out to be GBM on final permanent paraffin section diagnosis. That was due to the only viable area of tumor being processed and vascular proliferation and necrosis not being represented in cytological preparation. A case of gliosarcoma was reported as astrocytoma Grade IV on crush preparation as sarcomatous component was not well represented in cytological preparations. Seven cases showing partial correlation of FS with final diagnosis included 2 cases of benign meningiomas where typing of lesions did not match, 2 cases reported as benign neurogenic tumor on FS were further categorized as a case each of neurofibroma and neurilemmoma (schwannoma), 1 case reported as meningocele on FS turned out to be lipomeningocele due to nonrepresentation of lipomatous component in FS, and 1 case each of GBM and gliosarcoma reported as astrocytoma Grade III and astrocytoma Grade IV, respectively. These 2 cases GBM and gliosarcoma were the same cases showing partial correlation on crush preparations as well with probably the same reason of partial discrepancy in grading and typing. The sensitivity, specificity, positive predictive value, and negative predictive value in detecting neoplastic condition on cytology were 94.4%, 85.7%, 98.07%, and 66.67%, respectively, and that of FS were 96.15%, 75%, 96.15%, and 75%, respectively. The corresponding P = 0.872, 0.652, 0.986, and 0.561, respectively, without any significant difference detected among them, although the specificity of crush cytology preparation was slightly more than that of FS and negative predictive of the cytology was less than that of FS. Intraoperative pathological preparations (cytology/FS) are aimed at rapid and accurate diagnosis, especially when it is concerned for the CNS pathologies. FS preparation is thought to be a standard method for quick intraoperative diagnosis of CNS pathology and provides good cytomorphological details and finer histological typing. However, requirement of costly equipment, tissue availability, ice crystal formation, freezing artifacts, and inferior cytological detail as compared to the cytologic preparation are the limitations for FS preparation. The cytology is easy to smear the CNS tumors with good cellularity even when the sample is limited, and the rapid intraoperative diagnosis can be done within 10 min., None of the studies in the past have been documented showing variable results of the cytology and FS preparations when subjected individually to the neurosurgical specimen and few have correlated the cytology and frozen technique. In the current study, we have evaluated the diagnostic accuracy of cytologic and FS preparations for intraoperative CNS lesions and combined correlated these procedures to increase the diagnostic accuracy. In the present study, majority of cases (73.02%) were presenting in the age group of 21–50 years supported by Govindaraman et al. where it was 52.6%. There was a little female predominance in the present study with a male-to-female ratio of 1;1.1 and was supported by Govindaraman et al., Patil et al., and Al-Ajmi et al.,, Whereas, according to Jha et al., and Nanarng et al., there was a slight male predominance., Nearly 88.89% and 11.11% of the patients with CNS lesion in the present study were intracranial and intraspinal, respectively, and supported by Jha et al. (85.7%: Intracranial and 14.29%: Intraspinal). In our study, 87.30% and 12.70% of the patients were with neoplastic lesions and nonneoplastic lesions and supported by Nanarng et al. where, it was 82.7% and 17.3%, respectively. The diagnostic accuracy of crush/squash preparation was 80.33% where cases with complete correlation were considered, which increased to 93.44% when the cases with partial correlation were also taken into account. The diagnostic accuracy of FS was 81.67% when only cases with complete correlation were considered, which increased to 93.33% when cases with partial correlation were also taken into account. Furthermore, Roessler et al. reported the accuracy of crush preparation to be 89.8%, when only cases with complete correlation were considered which increased to 95% when cases with partial correlation were included. While Firlik et al. in their survey of brain biopsies found cytological investigations correlated with final diagnosis in 90% of cases (52% complete correlation and 38% partial correlation). In rest 10%, there was no correlation between intraoperative cytological diagnosis and final diagnosis. There was no statistically significant difference in accuracy of crush preparation and FSs in intraoperative diagnosis taking paraffin-embedded permanent section diagnosis as the gold standard (P = 0.971). In the present study, the two procedures cytology and FS complemented to each other in arriving at a correct diagnosis, which was supported by Brommeland et al., where, the addition of cytological smears to FSs improved intraoperative diagnosis. Therefore, the accuracy and other statistical parameters of cytological preparation (crush/squash smear) were comparable to that of FS in the rapid intraoperative diagnosis of CNS lesions and can be employed for intraoperative neurosurgical consultation. The diagnostic accuracy of cytological preparations (crush/squash smear) is almost equal to that of FS, especially in an experienced hand of a pathologist and can be employed confidently for intraoperative diagnosis of CNS lesions, especially when FS facilities are not available. Cytology and FS preparations when applied simultaneously for rapid intraoperative diagnosis of CNS lesions can provide a higher diagnostic accuracy by complementing each other's results. This study did not get any financial and material support from any funding organization and there is no conflict of interests among the authors. Govindaraman PK, Arumugam N, Ramasamy C, Prakasam G. Role of squash smear in intraoperative consultation of central nervous system tumors. J Sci Soc 2017;44:7-14. Jha B, Patel V, Patel K, Aggarwal A. Role of squash smear technique in intraoperative diagnosis of CNS tumors. Int J Med Sci Public Health 2013;2:889-92. Patil SS, Kudrimoti JK, Agarwal RD, Jadhav MV, Chuge A. 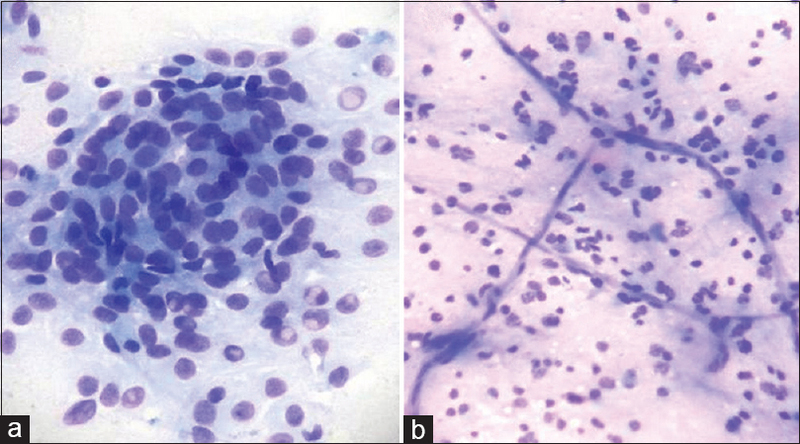 Utility of squash smear cytology in intraoperative diagnosis of central nervous system tumors. J Cytol 2016;33:205-9. Al-Ajmi R, Al-Kindi H, George M, Thomas K. Correlation of intraoperative frozen section report and histopathological diagnosis of Central nervous system tumors – A six-year retrospective study. Oman Med J 2016;31:414-20. Nanarng V, Jacob S, Mahapatra D, Mathew JE. Intraoperative diagnosis of central nervous system lesions: Comparison of squash smear, touch imprint, and frozen section. J Cytol 2015;32:153-8. Jindal A, Kaur K, Mathur K, Kumari V, Diwan H. Intraoperative squash smear cytology in CNS lesions: A Study of 150 pediatric cases. J Cytol 2017;34:217-20. Khoddami M, Akbarzadeh A, Mordai A, Bidari-Zerehpoush F, Alipour H, Samadzadeh S, et al. Diagnostic accuracy of frozen section of central nervous system lesions: A 10-year study. Iran J Child Neurol 2015;9:25-30. Brommeland T, Lindal S, Straume B, Dahl IL, Hennig R. Does imprint cytology of brain tumours improve intraoperative diagnoses? Acta Neurol Scand 2003;108:153-6. Bhardwaj K, Kriplani D, Bhake A, Bhardwaj K. Study of intraoperative squash cytology of intracranial and spinal cord tumors. Int J Res Med Sci 2015;3:3101-8. Sanjeev K, Aparna B, Anuradha K, Brijesh T, Sanjay K, Neetika S. Intraoperative squash cytology of central nervous system and spinal cord lesions with histological correlation. Ann Pathol Lab Med 2016;3:61-72. Sharma N, Misra V, Singh PA, Gupta SK, Debnath S, Nautiya A, et al. Comparative efficacy of imprint and squash cytology in diagnosing lesions of the central nervous system. Asian Pac J Cancer Prev 2011;12:1693-6.